This feature showcase uses Git as the example. 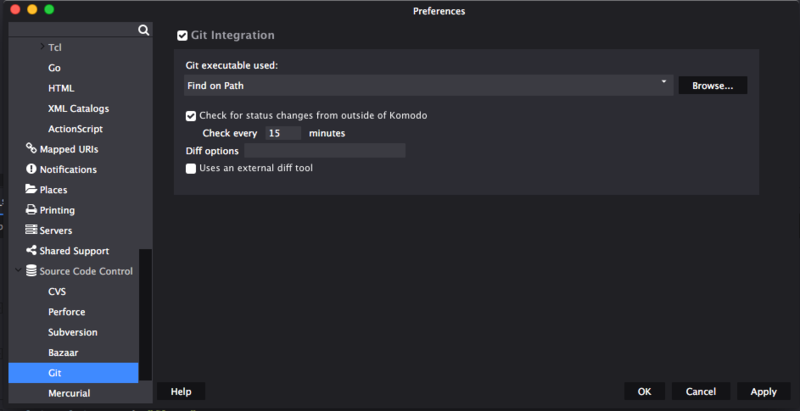 Select Edit > Preferences (macOS: Komodo > Preferences) and check the Git configuration. If the svn executable is in your PATH, you should not have to change anything. You can right click on a file in a project for a context menu with common Git commands. You can use the buttons in the SCC toolbar. The History button will show a list of file revisions. Clicking “Diff with local copy” in the History dialog box will show the differences between the selected revision and the current local copy. Clicking the Diff button will show the differences between the file in the current editor tab and the last revision. The output of all Git commands is shown in the Notifications tab in the bottom pane.